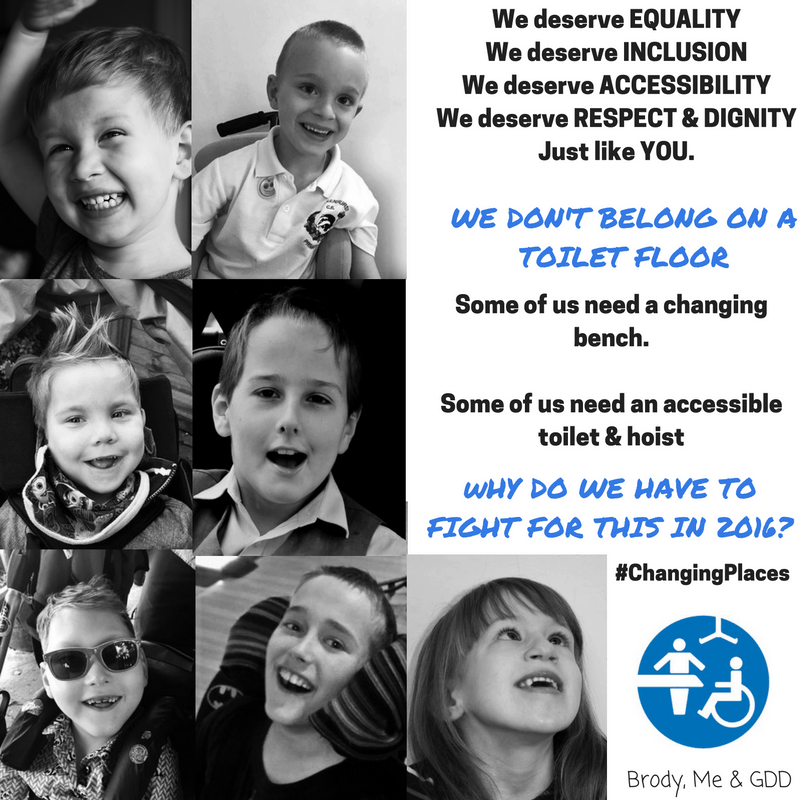 A post in support of the Changing Places Campaign. My son is above average size. The last time we took him to be measured he was on the 90th percentile for weight and height. At four years of age, he is too hard to lift for more than a few minutes. And he still wears nappies. It is easy to judge this. I have had people tell me that it is simply laziness on my part. 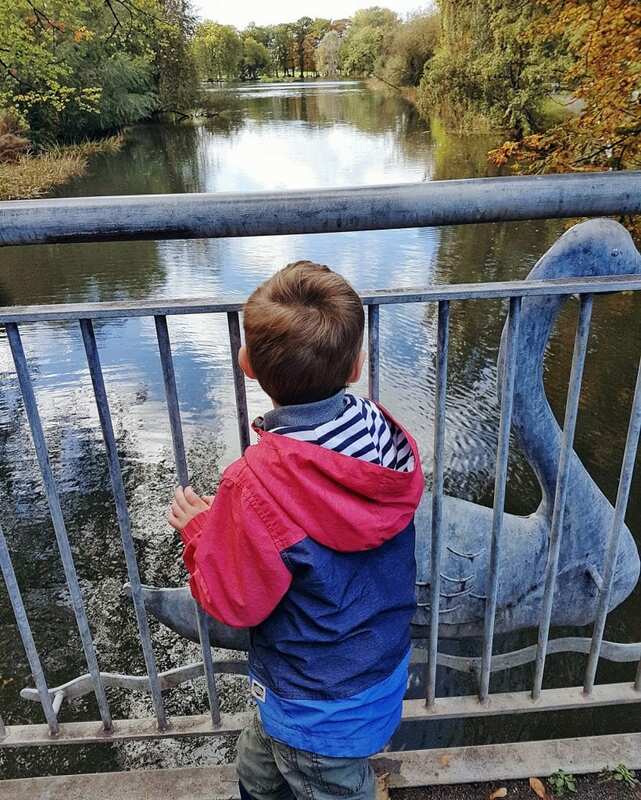 The fact that autism means he has extreme hypo-sensitivity, that the paediatrician says he is simply incapable of toilet training – his brain is not receiving sensory information from his bowels and bladder yet – that is of little consequence to those judging. At nursery, he struggles to get funding for the one-to-one support and additional needs he requires. One of those additional needs is that he is the only pre-schooler who is not potty-trained. He no longer fits in their changing areas. There is a chance that, unless the extra funding can be found, he must stop going to the nursery he has attended since he was seven months old. This would be incredibly difficult for him. I have changed my son on filthy toilet floors. I have had to sacrifice his privacy and change him in open spaces, simply because he does not fit in some changing areas. On a ferry, in the middle of the English Channel, I changed him while he stood up in a tiny cubicle while I balanced in the door way, legs half-way out of the room, door open. It was the only way we could fit. Even in places with disabled toilets, the changing tables are too small. And so, I do my best to cover the filthy toilet floors, and I get on with it. My son is relatively able-bodied and so it is our dignity that takes a beating, not our dignity and our very right to exist. The world is set up for those without disability. It doesn’t matter how many disabled toilets you see, or how much we believe society is progressive, the world only cares so much. My family experience it every day. However, the adjustments we must make are minor. They make our day just a little harder. They make us feel just a little ashamed. But we manage. We go out. We travel on the ferry. Life goes on. There are those who, because of the lack of the simple human right to use a toilet appropriately, are left feeling unwanted and despairing. There are young people who want to meet their friends, go to the theatre, have meals out – but they cannot. Disabled children and adults are left housebound and isolated. 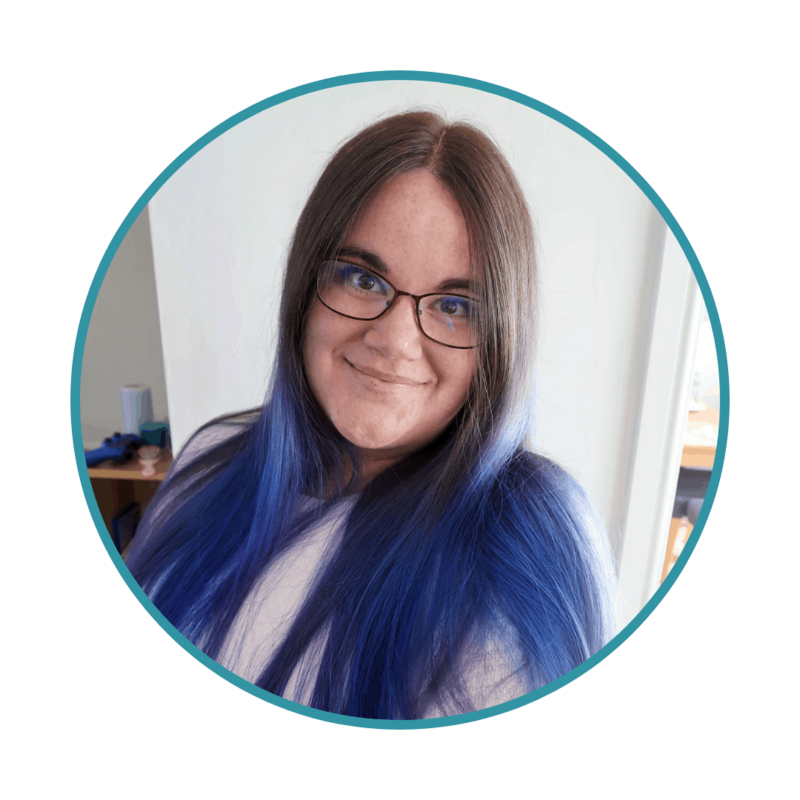 There are a quarter of a million people in this country alone, who cannot do daily activities that most of us take for granted, simply because there are no toilet facilities that allow them to do so. All that is needed, for these individuals to enjoy activities that enrich their lives and make them happy, is a larger toilet with a height adjustable changing bench and a hoist. In this day and age, I think it is absolutely unacceptable that so few places meet this need. 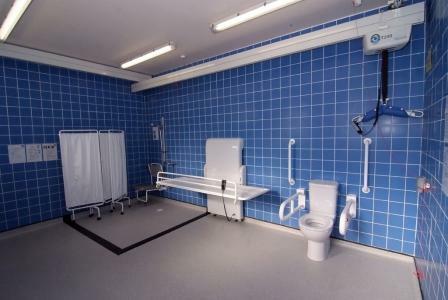 There are some brilliant blogs from parents, carers, and disabled people about why Changing Places facilities are so needed. Two of my favourites are Ordinary Hopes and Brody, Me and GDD by the lovely Laura. There are those who will say, for such a small demand, the cost of such facilities are not justified. There are those who will say that most businesses cannot afford the added weight of providing such facilities, for so few of their customers. There are those who will say that there is only so far we can go, only so much society can do, to help those for whom life is so much more challenging. But I say this – a society should be judged by how it treats its most vulnerable members, by how it helps those in need. And we can afford huge football stadiums, we can afford the X Factor and The Olympics and Made in Chelsea. Someone pays the cast of Loose Women their salaries. Is it really so unreasonable, so beyond the pale, in 2016, to ask that large facilities, places that spend millions of pounds attracting customers and patrons every year, cinema chains and service stations and shopping malls – is it really too much to expect that some of these places spend money on allowing disabled people to enjoy the things we all do? Is it right that there are only 892 toilets that meet the Changing Places criteria? I really don’t think it is. In support of the Changing Places campaign, I am posting today and using the hashtag #PhantomLoos. Hairy and unpleasant toilet situations like the ones I have experienced with my son are the norm for us. For some people the consequences of a lack of proper facilities could be much more scary. They could leave the disabled members of our society feeling valueless and alone. They could actively lower the quality of someone’s life, leading to despair and depression. We can’t let that continue. You can help change happen and make your voice heard. Click here to sign this petition to make Changing Places toilets mandatory for some establishments. We’re lucky Tyger was relatively easy to toilet train and Bear is making slow, steady progress. I was convinced it would be a struggle for both of them due to their autism so this sort of post makes me especially grateful but also extremely sympathetic because it could have been us. I’ll be heading over to the petition as soon as I’ve written this comment. EJ (6 yrs) cannot stand without help so lifting her in and out of her wheelchair without a hoist is going to get more and more risky for both of us as she gets older and heavier too.